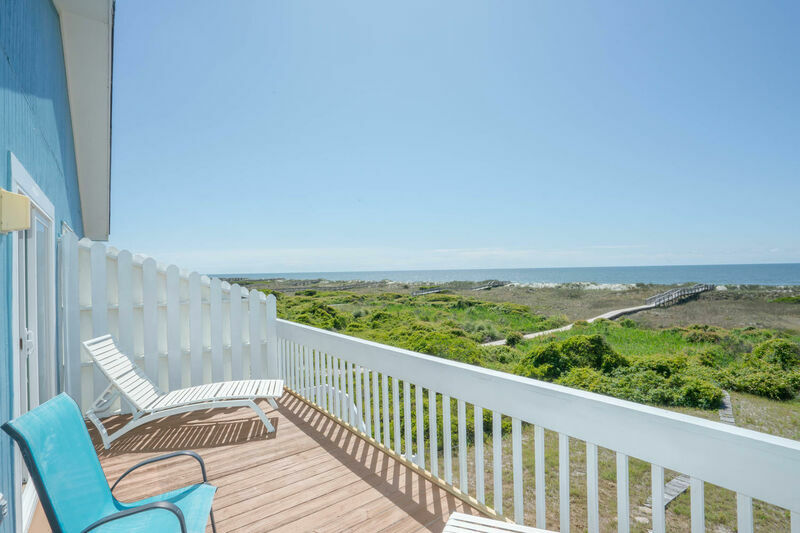 Star-Thrower (West - B) Traditional oceanfront duplex with 4 bedrooms and 3 baths. Upstairs bedrooms have a queen, queen/double, and a queen and two bathrooms. Downstairs bedroom has a queen bed and one bathroom. Two cable TVs, DVD, Internet access and a library of books. Fully equipped kitchen and dining table space for 12, plus a kitchen bar with 6 barstools. Relax on the covered porch and sundecks. Enclosed outside shower and changing area, outdoor dining underneath house. There is a shared built-in charcoal grill for both sides to use. The interior door connects to 506EM-A for large families renting both sides. Maximum Occupancy is 10 and pets are welcome too! Limit two dogs with a separate nonrefundable fee. Beach access is on 6th St.